The Nikos Kazantzakis Museum pays tribute to the important intellectual, author, thinker, philosopher, politician and traveller Nikos Kazantzakis. The Museum is made up of a cluster of buildings in the central square of the historical village of Varvari, now known as Myrtia, 15km south of Heraklion. 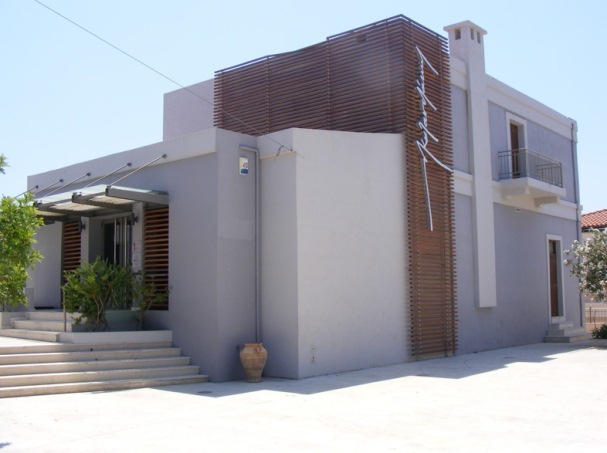 The Museum Exhibition is housed on a site formerly occupied by the home of the Anemoyiannis family, which was related to Nikos Kazantzakis’ father, Kapetan Michalis. It was founded by Yiorgos Anemoyiannis in 1983 and was renovated from the ground up in 2009, offering a new perspective on how the collections are displayed. Significant assistance was offered by Eleni Kazantzaki, the author’s second wife. The Museum holds manuscripts and notes by the author, first editions of his works in Greek and other languages, artworks and souvenirs from his travels among the overall 50,000 objects it possesses. They are all a legacy that brings alive the memory of Nikos Kazatzakis and promotes his work and personality. The Nikos Kazantzakis Museum has quite literally become a site of worldwide intellectual pilgrimage. Every day, visitors arrive from all four corners of the globe, bearing witness to the lasting relevancy of the word expressed by the great Cretan, universal author and thinker. Group visits should be booked in advance.